Lust Pro is a versatile typeface created by Neil Summerour and published by Positype. Lust Pro comes in 3 widths, 5 weights and italics for both Regular and Didone style. All weights & styles include Small Caps. Each width’s glyphs share the same footprint. Common weights between widths have adjusted vertical stroke width. The result allows for better interchanging between widths & weights. It is ideal for editorial projects and display use. Enjoy Lust Pro! 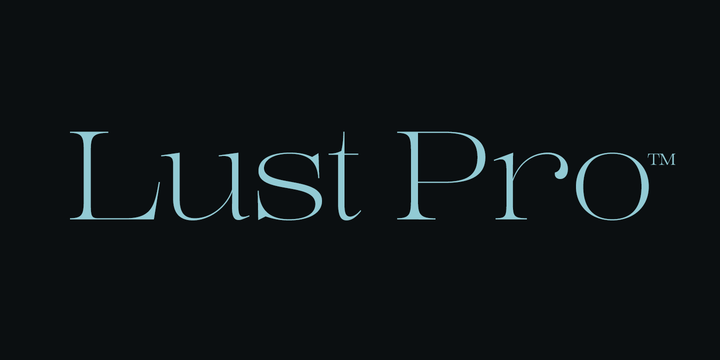 Note: Lust Pro is a trademark of Positype. A font description published on Monday, November 16th, 2015 in Fonts, Neil Summerour, Positype by Alexandra that has 5,123 views.